Most homes likely have a multitude of cleaning supplies housed in cabinets or on shelves. 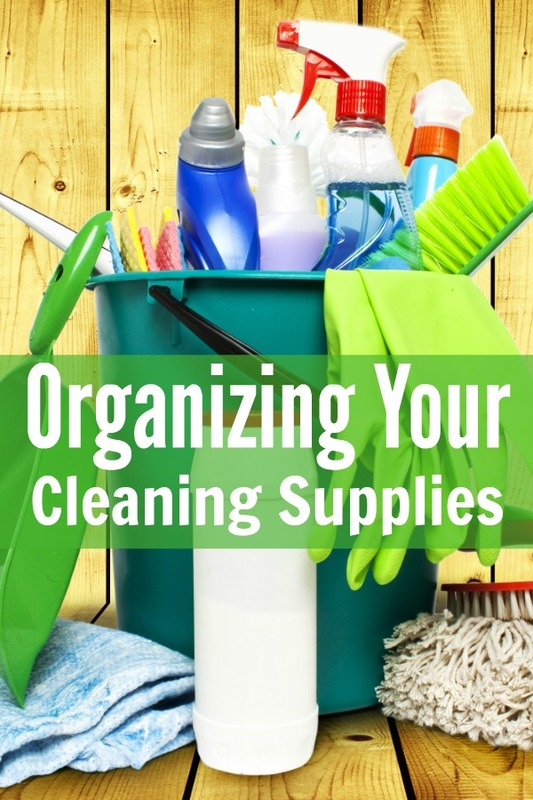 Organizing Your Cleaning Supplies will help you know what you have, but also keep your home cleaner as a result. Keeping things in central locations, eliminating unnecessary items and switching to better cleansers can help you keep your home organized, sanitary and free of clutter. Purge Old Or Unused Cleaners: We have all opened the cabinet and found rusty bottom cans, bottles with only an ounce left in them. It’s time to seriously clean house and purge old stuff. Those bottles that have only a small amount of liquid left can easily be poured into other same brand bottles. Anything that is rusty, corroded or looks suspicious should be disposed of as well. On occasion, we also buy something that just doesn’t work. If you don’t like a cleanser but have held on to it – now is the time to purge it as well. Switch To Multi-Purpose Cleaners: One thing that saves time and keeps cleaning supplies orderly is to switch to multi-purpose cleaners. There are many cleaning supplies out there that are good for multiple surfaces. You really need something that works on glass and windows, something for sanitizing and something for scrubbing soap scum. You can get away with 3-4 cleaners to handle almost any cleaning job in your home. Switching to multi-purpose cleaners makes it much easier to organize your cleaning supplies in your home. Keep Identical Cleaners In Bathrooms, Kitchen & Laundry Room: Organizing your home is all about saving time. One of the best ways to do that is to keep identical bottles of cleaners in each room you will be using them. We buy larger bottles and then use small spray bottles that have been labeled well. Store your refill cleansers in your laundry room, but put identical bottles in each bathroom as well as in your kitchen. This way you’ll always have what you need on hand and close by. Install Child Locks As Needed: While this is not about home organization, it is very important to remember. When children and pets are in your home, you need to stay on top of safety. If you have not installed child locks on cabinets where cleansers are stored, this is the week to do so. They are fairly inexpensive to purchase and easy to install in a few minutes. Organizing your cleaning supplies will help you to be able to clean your home quickly, easily and more effectively. This is important for cutting back on time spent tending to chores. The goal with home organization is to create an easier way of living that allows you more time with your family. This is one more simple step to free up time for your family. If you have any of the hoarding tendencies we describe in this post, you may want to work on getting organized for the New Year. Getting organized and staying organized always seem to be on my list of New Year’s Resolutions. Would you like to join me in getting organized for 2015? Each week we will tackle one area of the home to help you get organized, reclaim your sanity, and save money since disorganization can lead to spending more or missing out on discounts. Are you interested in actually getting organized for 2015? 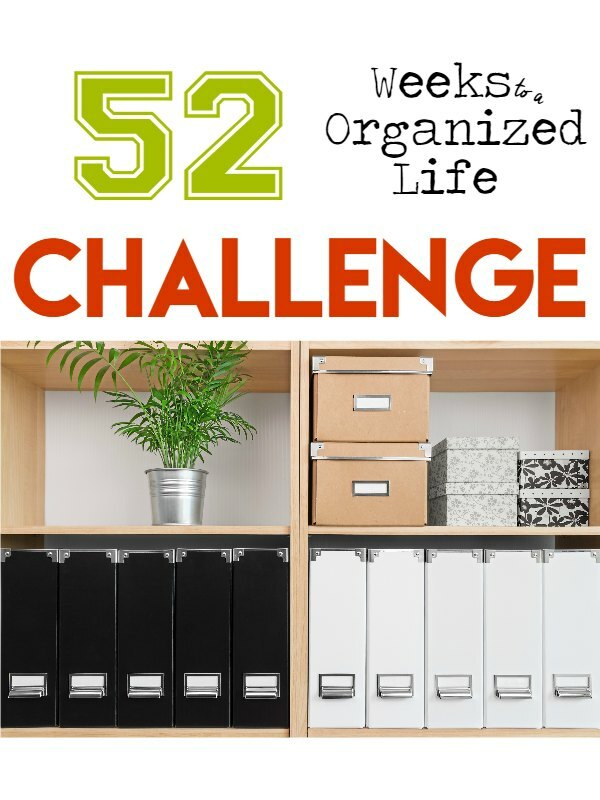 We have worked extensively on a series to help you get organized in 52 weeks. If you would like to receive these emails about how to get your home organized in 52 weeks, you can sign up to receive just ONE email per week. You can sign up at any time during the year without missing a beat. Did you enjoy this post? Find more money saving tips here.